Sometimes, fields that are available in Components creation need to be more personalized to business needs. 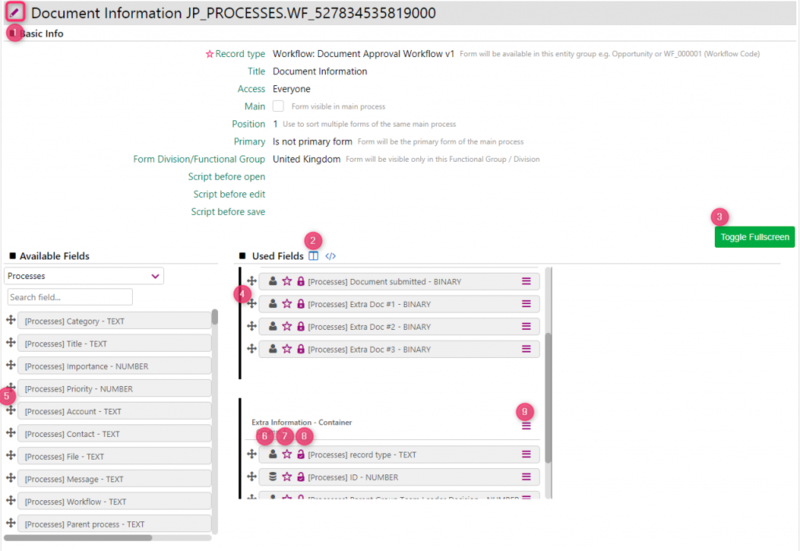 System Administrators can create User Fields that can be used in multiple Comidor objects globally; custom user fields can be added in User Forms for Workflow automation by Workflow designers, too. To manage global User Fields and User Forms, navigate to Application Menu icon> System Administration> Application Setup> User Fields or User Forms. In order to create a new User field,you should navigate to User Fields Unit from System Administration package. Then, Pressing the “+” button, create user field form opens. For Workflow fields, you should better create them via Workflow unit, please leave this field empty. Also, if you wish to create a Global field, do not link it to a Workflow, by leaving it empty. Email, which is a text field that should be of test@test.com form. List (Key | Value) is a Drop-down List. Define Value List: Key”0,1,2″ and Value”-,Text1,Text2″ for a drop-down list with 2 options. List (DB) will display a database list. Choose from existing Lists. Record will display a list of record entries in Comidor tables, choose the record list of the Unit you wish. List: eg. JP_TASKS, JP_USERS, JP_CONTACTS etc. if you wish to fetch a list of the tasks, users, contacts etc. Customizable Grid (JSON) refers to a json table. Grid Columns Title, Type etc. should be added. As you can see bellow, you build a table in the way you wish. 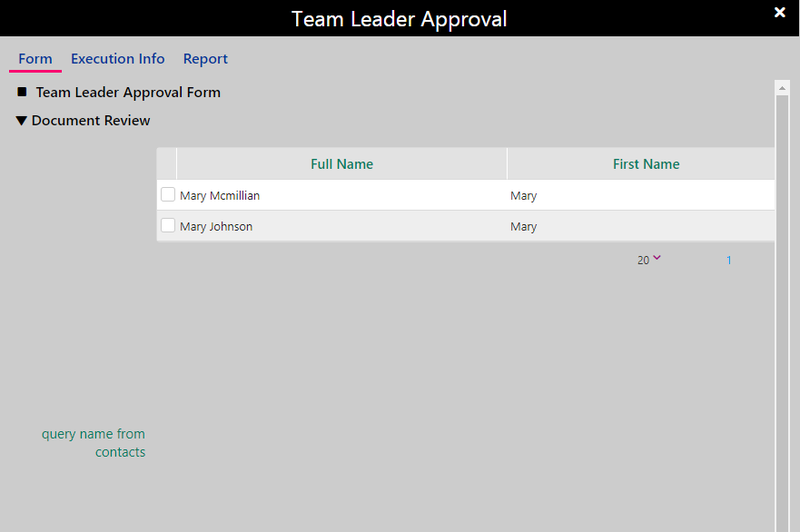 Simply choose the columns you want to have and set a Title and type. Based on the Type of field you choose, complete the Column size accordingly, and you may have to fill in another field. Such as, in the type Pre-populated list user has to fill in the Options [Prepopulated List] with the options you wish your list to have. Below you can see how this json table will appear to the user inside a Task. User will have to press on “+” to add an entry or “-” to erase. Choose Excel type for creating an excel spreadsheet that can be later filled by users inside a main form. In order to create a Query field, select Type: Query, Query Properties Key and Value should be added, as below. Select Number (9digit) or (15digit) depending on the size of the field you want. For currencies choose type Currency. Finally, for numbers with decimals, choose the field type Decimal up to 2 or 5 decimal digits. 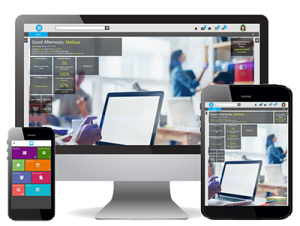 Contact support@comidor.com to get extra advice on custom user field creation. After saving the User Field, it will request to Reload Database so as the fields to be loaded in your system. All User Fields should be a part of a User Form. In order to create a new User Form, you should be a System Administrator. 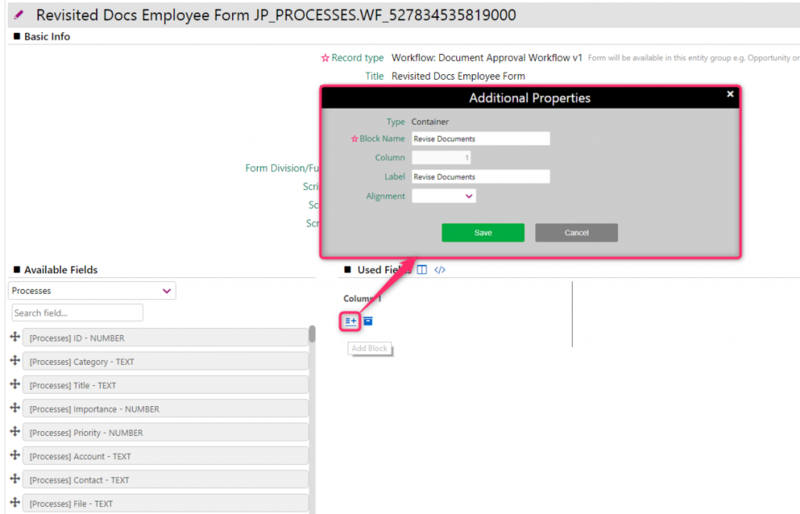 Firstly, you need to select a Record type, so as form to be available in this entity group. Access on this form; here you may select specific users/groups to have access in this data. By default is chosen Everyone. If you need this form to be Main this means that is will be visible in the main (process) view; this is suggested to be unchecked only in some Workflow Task cases. So, you have to decide if you want this form to be visible only inside the task or in the main process, too. Given the fact that this form is Main, you may specify its Position among the other forms exist in this Record. Access can be driven also based on Division/Functional Group. After saving the from, then you should create a component in order to organize your form and add your fields and be displayed in the way you wish. In the window that opens, fill in the Block Name, Column, Label, and the Alignment to be displayed in your form. Then, click save. Search database fields or/and custom fields from Available fields List and then and drag-n-drop them to Used fields list inside the Container you have created. Edit of User Form details. You can add a Container, a Component like Attachments or Notes, or Additional Properties (low-code). Click on Toggle full screen to view all of them in full screen. Re-arrange the components in the way you wish, if you have created more than one. Set a field as required with the star button. Click on small actions button of a used field/or Container to Delete it, or add Additional Properties (low-code). Additional properties (low-code) are also available, for alignment etc. For example, if you want to set a query you have to firstly go to Additional Properties. Then, set the filters of your query as follows. Here you can see how your query will be displayed inside a task. Tip: Useful can be the Settings examples of key-value pairs. In order to make a field View only, so that a user can not apply changes on it, you click on the Additional Properties and in Key you set Disabled and in value true. Form will be visible in the Record selected, following the settings added. 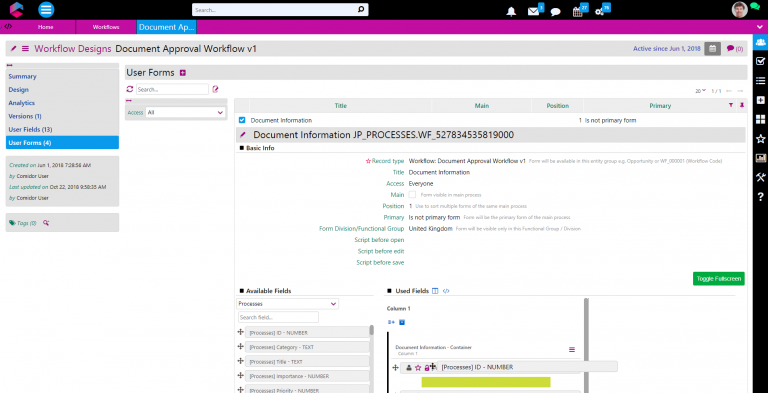 To manage workflow User Fields and User Forms for Workflows, navigate to Application Menu icon> Business Automation > Workflows. Enter the Workflow you are working on. Same can be performed inside the Process Templates using (Application Menu icon> Processes> Process Templates), having also here the ability to create a Quick form for Quick adds. Pressing the “+” button, create user field form opens. Customizable Grid (JSON) refers to a json table. Grid Columns Title, Type etc. should be added. 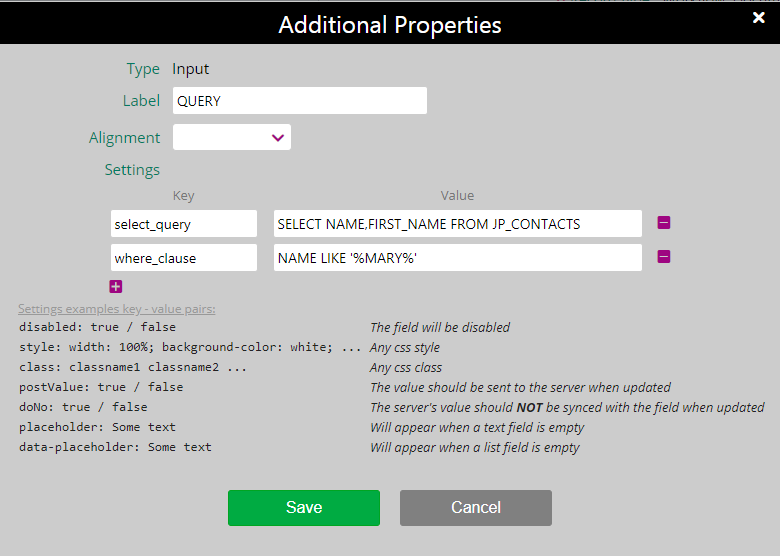 In order to create a Query field, select Type: Query, Query Properties Key and Value should be added. Especially for Process Templates you may select on Quick In process templates list, so as to be available in process template list in quick add process. Alternatively, choose in Quick add menu in order to use it directly at Quick Add button. After saving the from, then you should search and drag-n-drop database fields or/and custom fields to Used fields list from Available fields List. You can also lock a field, in order to make it view only. Finally, click on small actions button of a used field/or Container to Delete it, or add Additional Properties (low-code). Additional properties (low-code) are also available, for alignment etc. Form should be matched with a specific Workflow activity in order to be functional. 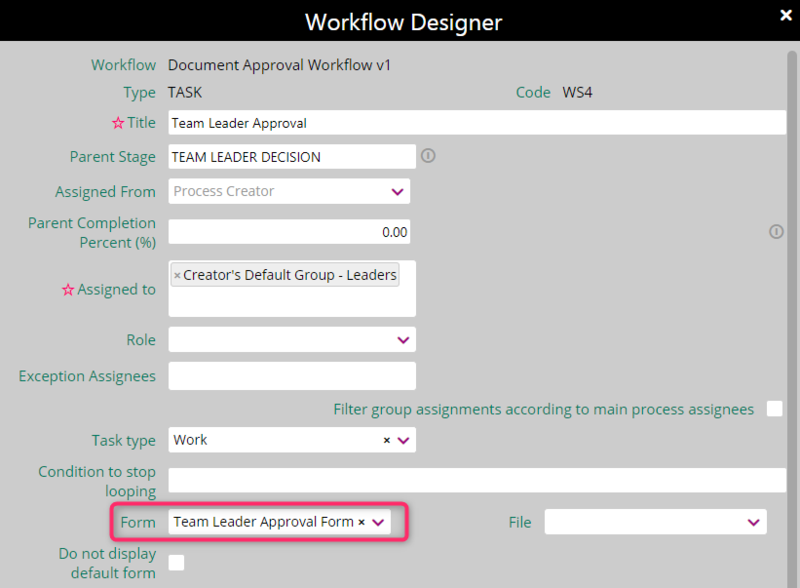 Get advised on how to apply a form in a Workflow activity from Workflows help center. 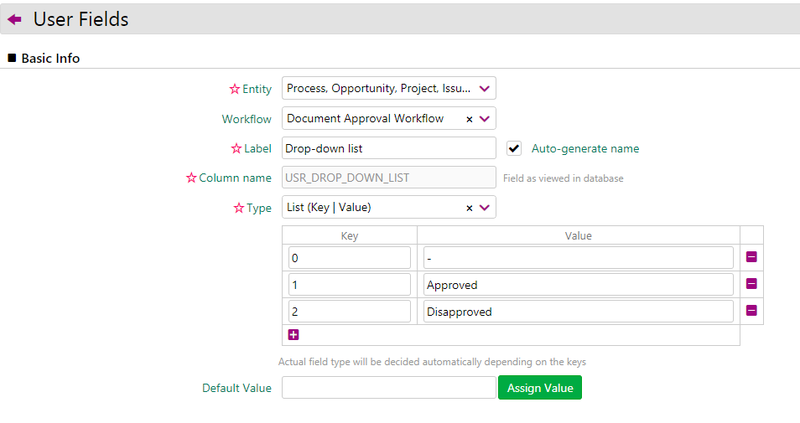 User Fields in User Forms of a Workflow can be used in Conditional flow of a Workflow, too.